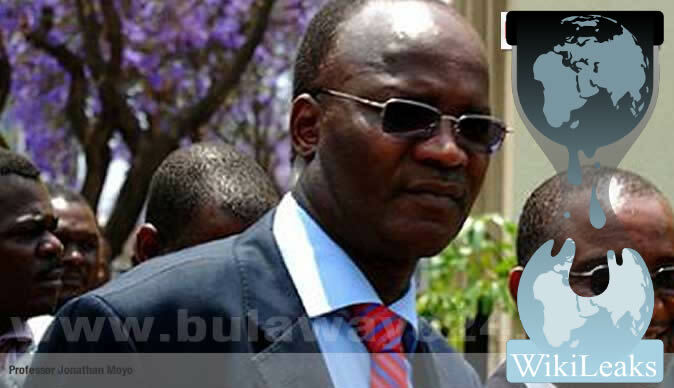 The whistle-blower website Wikileaks revealed that Professor Jonathan Moyo, a Zanu PF politburo member who claims to be one of President Robert Mugabe's foremost defenders advised the United States on how to penetrate Zanu PF and oust Mugabe. The information is set to expose Moyo's hypocrisy, as it emerges that, like many in Zanu PF, he publicly supports Mugabe by day only to undermine the octogenarian leader by night. Mugabe counts the US among his worst enemies. The cable, dated March 30, 2007, shows that Moyo dispensed to the Americans inner Zanu PF secrets, including a planned reshuffle of state security agents bosses to avert the possibility of a coup. This was at a time when the majority in Zanu PF had been angered by Mugabe's insistence on hanging on to power despite failing health and dwindling public support, the cable quotes Moyo as saying. According to whistleblower website WikiLeaks, some of the advice given by Moyo to former US ambassador Christopher Dell included how the Americans could achieve Mugabe's ouster by tapping into some of Mugabe's reform-minded allies. "Moyo urged the US to send positive signals about post-Mugabe future as this could help convince many party stalwarts to abandon Mugabe," reads part of the cable. "Moyo noted that Mugabe genuinely fears 'hanging' if he leaves office and suggested international guarantees for his safety could help persuade Mugabe to go. "Moyo urged the US to expand our outreach to Zanu PF moderates. The ambassador said we were working to do so but that many Zanu PF moderates were afraid to meet with us. "Moyo urged the US to send positive signals about the post-Mugabe future as this could help convince many party stalwarts to abandon Mugabe," reads the cable. The revelations are likely to anger Mugabe, who in 2004 accused Moyo of plotting a coup. The cable suggested that Moyo endorsed travel and economic sanctions imposed on Mugabe's ruling elite by the US and other Western countries to the extent that he even offered suggestions on potential targets. "On sanctions, Moyo accepted the placing of policy makers and their families on sanctions lists, but urged us not to list parliamentarians who are not members of either the Zanu PF politburo or central committee," read the leaked cable sent to Washington by Dell. The former US ambassador to Zimbabwe had a tumultuous relationship with Mugabe when he served in Harare from 2004 to 2007. Moyo had been expelled from Zanu PF when he met Dell. Moyo revealed to Dell how liberation war fighters implored on the late army commander, General Solomon Mujuru and Defence Minister Emmerson Mnangagwa, to urge Mugabe to step down. "Moyo said he thought it highly unlikely the military would act on its own and stage a coup. The surviving members of the General Staff of the Zimbabwe African National Liberation Army (Zanla) had recently approached both General Solomon Mujuru and Mnangagwa to urge Mugabe's retirement. "They believed Mugabe would be defeated in 2008, and it was important for Zanu PF to put forward another candidate to win and preserve liberation gains. Mujuru's response was to have the leaders talk to Mnangagwa; Mnangagwa in turn rebuffed them, saying the central committee had replaced the High Command as a political decision maker," reads the cable. The former information minister told Dell that a major shake-up in the security sector was in the works to "break up potential coup-plotting networks." "With regard to the CIO (Central Intelligence Organisation), Moyo said Mugabe had received information that CIO director Happyton Bonyongwe had been conferring with Solomon Mujuru. "Furthermore, he had received information from CIO sub-directors that Bonyongwe was doctoring information. Believing Mujuru to be involved with both military and CIO dissension, Mugabe had summoned Mujuru. "According to Mugabe, Mujuru had not yet responded. Meanwhile, a massive shake-up was underway in the security services, with many re-assignments within and between agencies being made in order to break up potential coup-plotting networks," reads the cable. In the cables, Moyo is also quoted seeking support from the US for his Third Way project which would have seen them replacing Mugabe with "people acceptable to both the MDC and Zanu PF." He told US officials that the project would target disgruntled officials and supporters from both parties. The cables also reveal Moyo met several US officials on a number of occasions and at times after he would have initiated the meetings.